I can’t believe how quickly time has passed. A year ago on the 2nd September my Fiance and I got engaged and in just two weeks time we will be getting married! 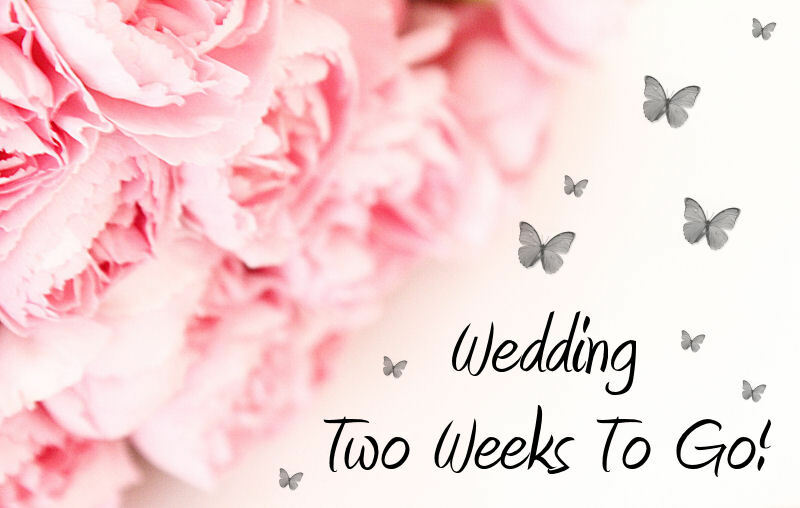 Sorry I haven’t kept you all as updated as I would have liked, I have been very surprised by how much wedding planning has taken over my life despite being very organised from the beginning. I can’t imagine how people plan wedding’s in a shorter period of time! On the final count down to the wedding I’m flooded every now and then with a feeling of panic in case I’ve forgotten something. I find myself checking and re-checking orders, lists, food choices and RSVP’s etc to ensure everything is as we expect but my to do list still feels as long as ever. The last few weeks have also been filled with endless appointments as we meet all of our suppliers for the final time and confirm the schedule, locations and must have’s with them. This has also been really fun because it’s putting all the final pieces together and it’s been really lovely to be surrounded by people who are getting excited about our big day. The next two weeks for me will be filled with finalising our schedule for the day as well as our photo’s list. I also have a final dress fitting (and I really must break in my new shoes!) as well as some pampering sessions including a eye lash tint, eye brow wax and tint, manicure and pedicure which I am very much looking forward to! I also have some time booked in with my mum and Maids of Honour who will be helping us put together our carefully designed favours and cake boxes. I’m looking forward to this a lot at we’ll make some lovely memories. As well as being excited and slightly stressed I keep feeling a little sad that after such a big build up in just two weeks our special day will be over. I want to make sure we both enjoy every moment and take some time to absorb it as I know it will go by in a flash and it’s very common for people not to remember large chunks of the day. I want to try to prevent this if possible! I can’t wait to see how everything comes together and if it’s how I’ve pictured it in my head! What did you think of this blog post?